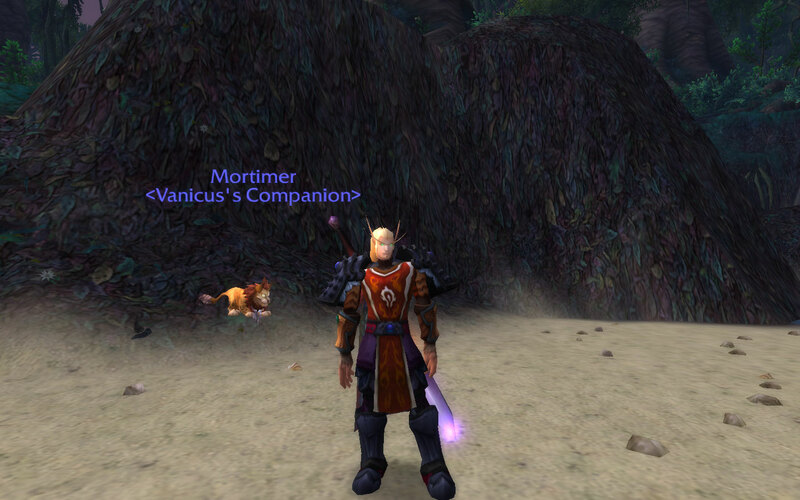 So … I’ve been doing the Fabled Pets daily … pretty much daily. I think I missed the first couple of days when I realized I’d have to kill the whole circuit each day, but once I got teams made up to deal with them and got a route firmly set, it’s not so bad. I ran it last night after raid with no stops for anything else (other than picking up an Ancient Jinyu Staff out of the Slicky Steam near the caterpillar) and it took about 35 minutes. In making the teams, it seemed like, since we’re only fighting a single opponent, the best strategy is to just load up on a trio of pets who are strong against its type. This gives us three teams since there are three types of pets to face. I gave them appropriate, if unimaginative, names: Aquatic Killers, Beast Killers, and Critter Killers. One pet ended up on all three teams. I put him as the anchor on each team, figuring there will be some battles where the third pet doesn’t even get called in, and then if I am fighting a different kind of pet for the next battle, I won’t have to heal in between since he didn’t take damage. This lets me use fewer bandages. His placement on the aquatic team goes without saying. Flying pets are strong against aquatics. This is the team that it makes the most sense for him to be on. But what about the other teams? Why would I use a flying pet on them? 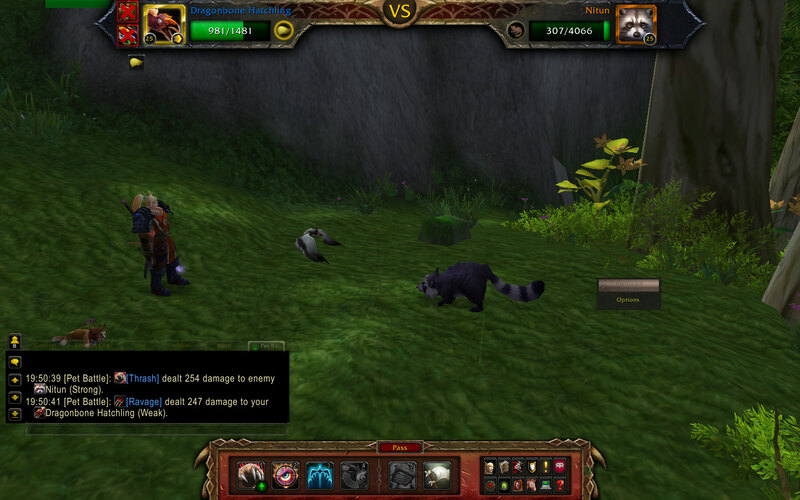 Well, beasts are weak against flying pets, and I don’t have 3 mechanicals leveled. 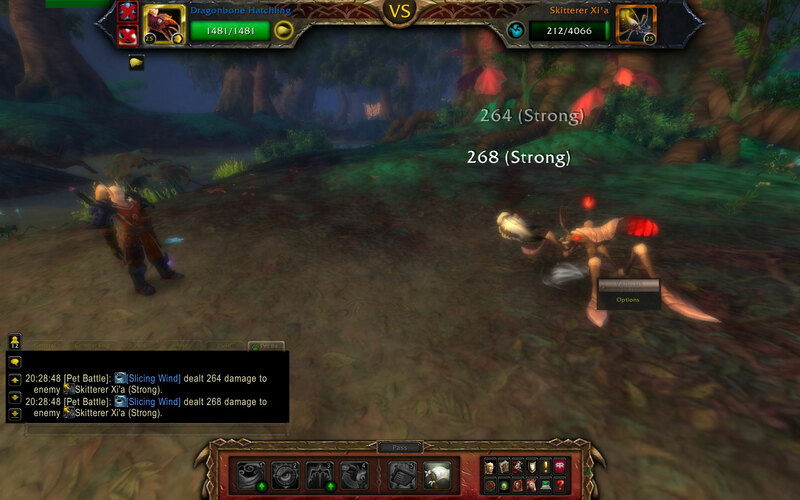 Most of the time, the Clockwork Gnome and Pet Bombling get the job done on their own. Gorespine, though, tends to put them down with the bleed, so my little buddy often comes in for cleanup on him. For critters, I change out his first ability, replacing Slicing Wind with Thrash, which of course is a beast ability and is strong against critters. Nitun is a pain, but thrash can put him under quickly. As a bonus, Nitun’s abilites are .. beast abilities! So they are all weak against the flyer. 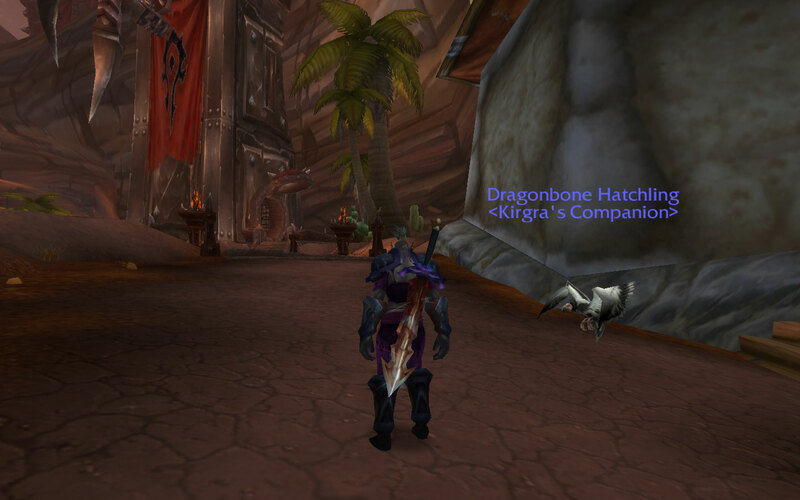 To get your own Dragonbone Hatchling, just head to Dragonblight. They can be found in large numbers on the plains surrounding Wyrmrest Temple. Other pets that share the same abilities include the birds from the parrot family, the mini jousters from Hyjal, or the Fledgling Buzzard from Redridge. Now all he needs is a name, it seems silly to have him be so important to my teams and not have one. Any suggestions? Oh yeah, as for the results of all these dailies … I have gotten either a battlestone, a pet, or sometimes even both, almost every day. I think there have only been 3 days when I didn’t get either one. I have gotten 4 Snowy Pandas, 3 Sunfur Pandas, and probably 8 stones. I didn’t keep track and I should have. Oops. 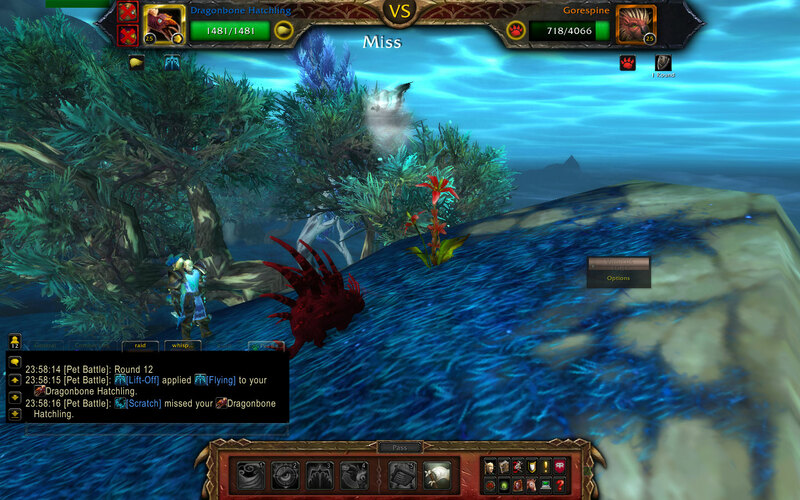 You requested reports from the field in Pandaria. I have recently been on assignment in the southernmost part of the continent, in an area known as the Krasarang Wilds. It was there that I ran into a bipedal reptilian species known as the Saurok. I was fighting three of these creatures when, unbeknownst to me, a fourth unstealthed behind me. Suddenly this flying ball of fur and claws whipped past my head, and when I bested my opponents and turned around, this tiny windrider cub had attached himself to the Saurok’s face. Henceforth, he has followed me everywhere, and, given his bravery, loyalty, and ability to watch my back even at such a young age, I thought it appropriate to give him a worthy name. I have long been an admirer of your own Mortimer, and hope that mine will live up to the name.